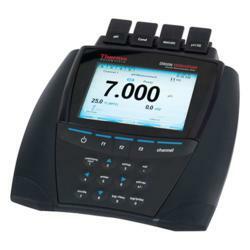 For an advanced electrochemistry meter that offers versatility for multiple uses, Cole-Parmer introduces the Thermo Scientific Orion VERSA STAR™ Meter. Measure up to four channels at once! Customize channels by selecting from five interchangeable parameter modules: pH, pH/ISE, conductivity, DO/RDO, and pH with LogR. Read measurements on the large color graphic LCD with intuitive multilingual (English, Spanish, French, Italian, German, and Chinese) interface. Nonvolatile memory holds up to 2000 data points with time-and-date stamp. Transfer data via two USB and RS-232 ports. Choose the meter with separate modules, the meter with module packages, or full kits containing meter, modules, electrodes, and solutions. Easily add or switch out modules as needed. For more information, call 800-323-4340 or visit ColeParmer.com/19071.